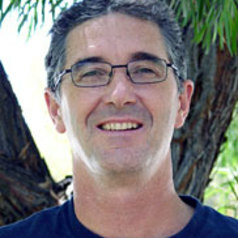 Dr Russ Babcock is a marine ecologist with CSIRO Marine and Atmospheric Research. He has broad interests including invertebrate reproduction and larval ecology, the effects of coastal development, marine conservation and trophic cascade effects. Application of new technologies such as Autonomous Underwater Vehicles and acoustic tagging and tracking to provide new ecological insights for better management.